This past weekend, black belt and International Jiu Jitsu Education Fund Vice-President Ishmael Bentley held a fundraising seminar at his Minneapolis-based academy, M-Theory Martial Arts. We’re so proud and excited to see the amazing turnout from jiu jitsu practitioners across the Twin Cities area. We were able to raise over $2000 for IJEF, which will provide months of support and supplies for our instructors and Thank you to everyone who came to support and who donated to our cause! We’d like to give a special thanks to Black Arrow Martial Arts, Minnesota Top Team, Southside BJJ, The Academy and its founder Greg Nelson, Spartan Martial Arts, and the Grappling Central Podcast! Hopefully you’ll hear Professor Ishmael soon on Grappling Central — we’ll be sure to share! Until then, keep Rolling Toward a Better World! 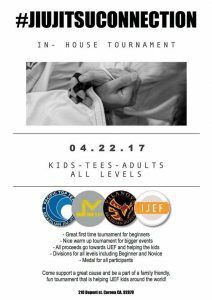 Come to the Jiu Jitsu Connection IJEF Benefit Tournament, Saturday April 22nd! This weekend’s Jiu Jitsu Connection IJEF Benefit Tournament will be the first in-house tournament held by Jiu Jitsu Connection — we are so excited to have the support of this California-based Jiu Jitsu association. Jiu Jitsu Connection is an association of friendly academies that get together for training, exchange, and support. They’ve been highly involved with a number of charitable organizations, raising funds for breast cancer awareness, important surgeries for members of associated academies, and now IJEF kids! Originating with Level Up Brazilian Jiu Jitsu in West Los Angeles, Pacific Top Team in Corona, and Vilanova Brazilian Jiu Jitsu in Camarillo, Jiu Jitsu Connection has grown to several other academies and has become a great movement of Jiu Jitsu friendship. Thank you Jiu Jitsu Connection for your support of the International Jiu Jitsu Education Fund! If you’re interested in participating in the Benenfit Tournament, check the Facebook event or contact Pacific Top Team in Corona, California, the host of the tournament.